Plenty of people like their tequila on ice, Channing Tatum included. Channing Tatum’s “Tequila” is probably the most badass of the booze-named Statesman — the American equivalent of the Kingsman — in The Golden Circle. But you’ll probably be surprised to learn that his role is minimal because this Tequila spends most of the film on ice — literally. Spoilers for Kingsman: The Golden Circle and Tequila’s history with drug use follow. After the surviving members of the Kingsman link up with the Statesman in the U.S., it’s revealed that Julianne Moore’s villainous drug lord Poppy Adams laced all of her illicit drugs with an incurable poison. Every drug user worldwide gets a blue, veiny rash. It also serves to publicly out every drug user, even the innocent pot-smokers that do it on the down low. Among the millions of victims worldwide is Tequila, who gets pulled from active duty immediately. Once they realize that the rash will lead to death, they cryogenically freeze him until they can get him the antidote at the end of the movie. In this way, Kingsman: The Golden Circle sidelines and totally underutilizes one of its best comedic actors, which is just ice cold. Channing Tatum as Tequila alongside Halle Berry's Ginger Ale. Tatum does get in one awesome fight in which he singlehandedly takes down both Eggsy and Merlin. Through this, we’re meant to assume that he’s the most badass Statesman around, especially when he nearly burns the two of them alive. 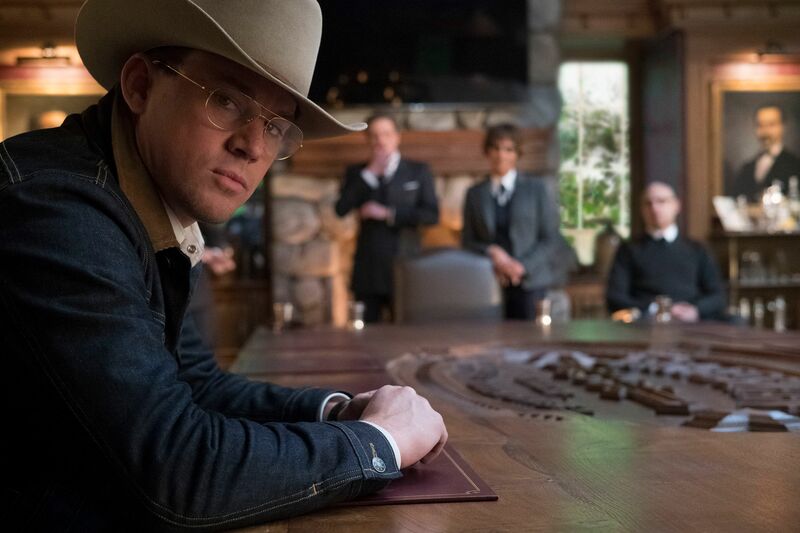 The first Kingsman came alive with the spectacles Colin Firth’s bar and church fight scenes, and you can’t help but want the same from Tequila. What cool things might Tequila do with his lasso and whip? Instead, Pedro Pascal’s Whiskey serves as the poster child for the Statesman. He gets all the badass scenes, including a barroom brawl complete with a high-tech lasso and whip, and that’s the first of many great sequences. But we honestly wanted more from Channing Tatum, who had a prominent seat at Comic-Con promoting the film. Director Matthew Vaughn did reveal in an interview that the original cut of The Golden Circle clocked in at 3 hours and 40 minutes, possibly leaving some of Tatum’s other scenes in the hour and a half that was eventually cut for the theatrical release. Tequila made short work of Eggsy and Merlin. Despite Tatum barely appearing in The Golden Circle, he’s shown at the end of the movie dressed like a dapper Kingsman, entering the newly rebuilt London tailor. Does that mean he joined the British agency or just cleaned up his oufit? But the real question here is obvious. Would his Kingsman name be Percival or Gawain? Kingsman: The Golden Circle is now out in theaters.